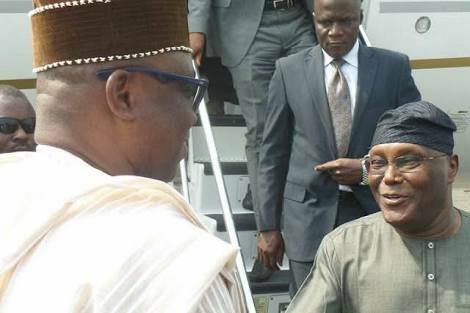 The Peoples Democratic Party (PDP) has condemned the searching of its presidential candidate, Atiku Abubakar, by security operatives as he landed in Abuja from Dubai on Sunday morning. Atiku said that the action was meant to “intimidate” him. Atiku will challenge President Muhammadu Buhari in the February presidential election. It said the search did not turn up “anything incriminating” but that the agents “tampered with” Abubakar’s belongings including campaign documents. The minister of aviation, Hadi Sirika, described the incident as “routine” and said the process applied “to all international arrivals” in a statement responding to the claims. “While it is true that the Task Force on Currency at the airport did the routine action of checking the former Vice President’s travel bag, he was accorded full respect as a senior citizen,” he said. AFP reports that Atiku earlier voiced concern about tensions surrounding the presidential campaign, telling reporters his rival, Buhari, was “uncompromising” and “power drunk”.